The Royal Canadian Mint have launched a new series of coins entitled “The Second World War Battlefront” with the first coin in this 10-coin series paying tribute to the Battle of Britain which began on the 10th July 1940. Luftwaffe Bf 109 Messerschmitts crossed into British airspace to strike shipping convoys and centres. Despite being outnumbered nearly 2 to 1, the Royal Air Force (RAF) had a key advantage throughout the ensuing attacks, a network of radar stations eliminated the possibility of any sneak attacks. This allowed for fighter squadrons of Hurricanes and Spitfires to scramble and intercept the enemy. Canadian pilots joined the series of short-range aerial combats, including members of the RAF’s No. 242 “Canadian” Squadron and the RCAF’s No. 1 Squadron, which became the first Canadian unit to face enemy planes in a dogfight over Southern England on August 26th 1940. Other Canadians played a role serving in RAF Bomber and Coastal Command squadrons. Daily raids continued and after unleashing heavy attacks upon RAF targets throughout August, the Luftwaffe broadened its targets in September to include a key civilian target, London itself. The RAF resisted and in the face of mounting losses, Hitler postponed his planned invasion dubbed “Operation Sea Lion” and turned his attention to the East. On October 31st 1940, the Battle of Britain came to a close. Although the Luftwaffe would continue night time bombing raids until May 1941, it had suffered its first defeat by failing to disarm British defenses during those pivotal three and a half months. 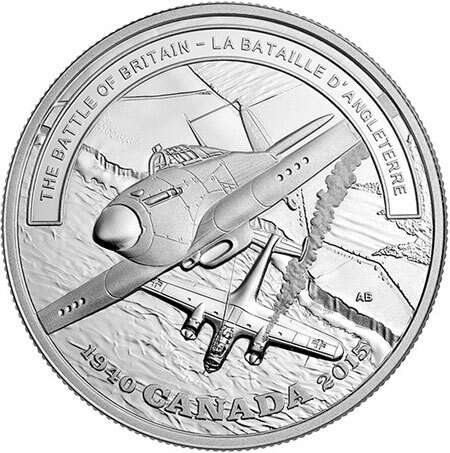 This coin, designed by Ardell Bourgeois pays tribute to Canada’s role in the Battle of Britain with its depiction of a dogfight in the skies above Dover. At the helm of a Hawker Hurricane, a Canadian fighter pilot ascends higher after firing upon a Dornier Do 17Z—the enemy plane has seemingly dropped in altitude as a trail of dark smoke billows up from one of its engines. Well below these fighter planes, the background recreates England’s beautiful southeastern coast, where the waters of the English Channel meet the famous White Cliffs of Dover. The obverse includes the effigy designed by T. H. Paget which appeared on Canadian coinage during the Second World War, that of HM King George VI, father of the present Queen. The coin is available as an individual purchase or as a subscription with a total of ten coins completing the set. For additional information on this coin or to place an order, please visit the Royal Canadian Mint product page. Information offered in English and French, international orders dispatched.